Today is Anakin's birthday. So why do I have a photo of Farva wishing Anakin a happy birthday instead of a photo of Anakin? Well, because Mr. Birthday Boy is a diva and he refused to pose for photos this past week. I kept trying to sneak one of him but anytime I pulled out the camera he went and hid. What a brat! Since it's his birthday (and he's turning 6! what an old man) I let Anakin off the hook and let his brother (the ham) wish him a happy birthday. So happy birthday Anakin! I promise you will get lots of snuggles and treats...and no photos taken of you. haha, Happy birthday to Anakin! Happpy Birthday to Anakin. I love his look on that photo - he's quite the character, not? Happy Sunday and enjoy the snuggeling! 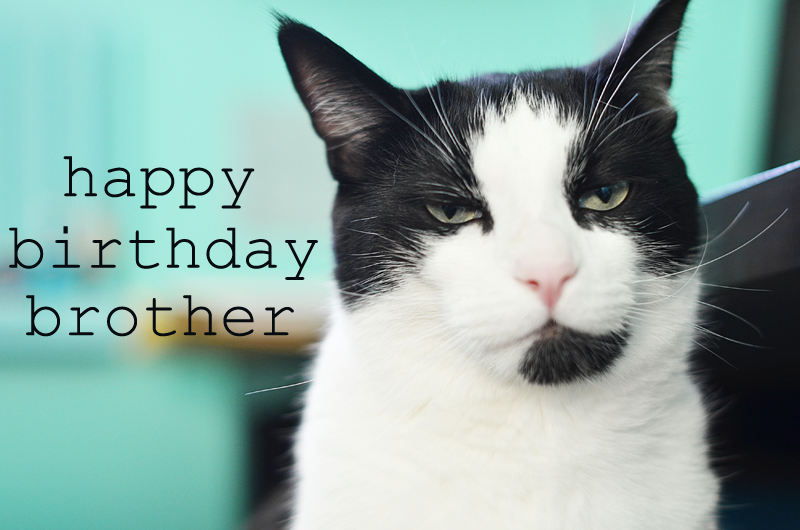 Happy Birthday Mr. Grumpy pants! Farva is such a cutie too! Animals are so funny, with how they react to cameras. Like, my dog, whenever I get out my camera and point it at her, she sits perfectly and stares at me, like she knows I'm taking a picture of her. It's so cute. Anyways, happy birthday to Anakin and may he have a great/photo-free day! Happy Birthday Anakin! Such a diva birthday boy!! Send him some head rubs from me! Such a cute face! I love your cat pictures. This made me laugh so much. Happy Birthday Anakin! aww hahaha happy birthday to Anakin! !